Properties in Spotorno average 4.5 out of 5 stars. Property 15: Noli, First Floor Apartment With Garden! Property 24: Calice Ligure: Rural House of 1700 immersed in the greenery of nature. 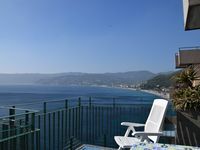 Property 27: Beautiful and new apartment near the beach of Finale L.
Property 31: Spacious, Airy Apartment in Sunny San Bernardino, Finale Ligure. Property 49: Ca' de Alice - Mare, verde e relax in Noli!